Since September 2017 Gonzalo and I live together in Castellón de la Plana, Spain. We got used to daily life so fast. Whatever we appreciate being together every single day, because we know what it means to be together for just a certain time. To avoid boredom we decided to make ourselves a special birthday present: a road trip! The aim of our trip was, finding mystical shores, dazzling landscapes, lovely villages and to catch every sunrise and sunset. Where in Spain can we find mystical shores? There is no better place for mystic than in the north of Spain! Why? Let us explain you with pictures, videos and words.. I made the experience that I had a completely different idea of Spain before I started to travel. On TV, in school or in conversations, all I heard was, Spain and its blue sky, sunshine everyday, sand beaches, palm trees and it’s hot there. Do you know those associations? This was my association before I discovered the country of the sunshine myself. The north of Spain is (almost) the opposite of the association I had years ago. Rough sea, wild beaches and endless shores is what you can expect especially in the region of Galicia. One of the top one artwork created by mother nature is The Cathedral Of The Sea – La Playa De Las Catedrales. Mother nature created huge impressive gates that rise out of the beach. Arches within arches that are about 30 meters high. Once you stand in front of them you will understand and feel the meaning of the name. We went twice to The Cathedral of The Sea. One time at a random time and once for the sunrise. Both times this magical place presented itself in two different ways. The first day we arrived at the beach at around 11am. Before going there we checked the tide times online. This is important to know if you plan to walk on the beach. With high tide you can only watch the arches from the coastline. When we explored the huge arches and its beauty by wandering around, made us timeless. 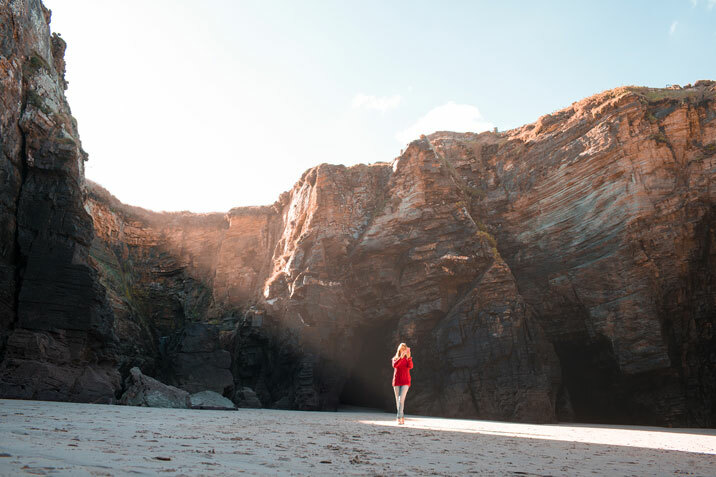 Walking from one cave to the other, watching the rough sea knocking on the rocks, discovering hidden paths and in our case taking lots of pictures – in other words, forgetting the time. Isn’t it the best that can happen, to just forget the time while enjoying nature? Well, in this place it is definitely, but it’s quite dangerous as well. Imagine us wandering around on this huge beach with those impressive cathedrals forgetting time and place. After spotting one cave we found a hidden path that led us to another inconspicuous cave. We simply got lost in paradise! Far away from the stairs that brings you up to the main coast again, we suddenly noticed that the water is returning again. Therefore we headed back. Unfortunately there was no easy path anymore. The rough sea had arrived and created some little deep rivers and lakes. We stood thus in front of a small lake that rose with every minute higher. This adventure entertained us pretty much. At least the water level was quite low, so we didn’t need to take a cold refreshing swim. I was ready to take of my shoes and socks. An icy feet bath is good for the blood circulation 😀 Well, Gonzalo decided to not take an icy bath. He rather preferred to clean his shoes in some salty water and to get rid of the lovely cheesy smell. The end of the story was, we arrived on time back to the stairs. All good, we were lucky! My body was energised again. Back at the car Gonzalo noticed the price he had to pay for not energising his body: Wet shoes and socks for the rest of the day. Fortunately the sun was our constant companion and warmed him up. To sum up, even though it’s hard to not forget the time in paradise, be aware of the changing tides and get back to the stairs on time. The second time we came to The Cathedral of the Sea, we arrived for the sunrise. Waking up early and standing in the cold at dawn worth it absolutely! We were the first people who made steps on the untouched wet sand. The sun rose in the east and on the west the moon was still present. It was a spectacular scenery that we tried to catch with some shoots. Moreover our road trip brought us to an unobtrusively shore in Asturias. From far you can’t recognize what is waiting for you. You need to get closer to the coastline and listen. Can you hear the silence? This piece of earth is astonishing especially at sunset time. It’s called the Beach of the Silence – Playa del Silencio. The truth is close to the coastline you really can’t hear anything except of the seagulls and the wind whistles around your ears. It’s hypnotizing beautiful! There is also a way down to the bay in case you wanna touch the refreshing water or swim in the silence. 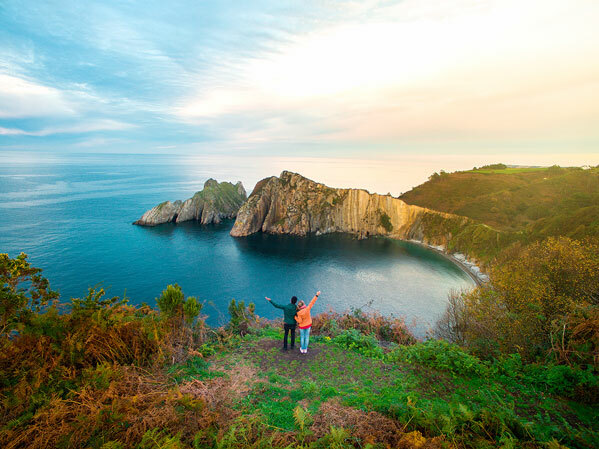 Playa del Silencio is one of our tips for you, when you’re looking for a special way to end the day. While discovering mystical shores, we also passed by lovely villages with charming lighthouses. Our base of the road trip was the lovely fishermen village Luarca. It’s a quite small town that has a fascinating colorful harbor and a charming lighthouse. On our way back from the Cathedral of the Sea to Luarca we stopped by coincidence in Tapia de Casariego. We had some time left and the sun was just about to set, that’s why we looked for a neat place to capture it. This village enchanted us! Before coming here, we didn’t know what is waiting for us. The lighthouse is based on its own island that is connected to the mainland by a short path.